The contest committee is pleased to invite you to the first round in the SAC Polar Battle 2018. Please take a look in the updated rules and choose a suitable entry category. The updates include changes in the Multi Operators Single Transmitter category and how you should deal with stations not sending a serial number in their report. All updates are marked with red. Please read the rules before the contest! Don’t forget to announce your own activity. Doing so will inspire others to join and make their own challenges. Those who have already signed up can be seen at Annouced operations CW and SSB. If you need to change your entry, just email us at support@sactest.net. Thanks to the generous contributions of many individuals, there are several Sponsored Plaques available for both Scandinavian and non-Scandinavian operators to pursue. Please take a look at the last years sponsored plaque program and pick your target. Note: QSO’s outside these limits will be given zero points and no multipliers in the log checking. This website functions as the SAC information hub, but SAC also has a social media presence, and you can “like” the SAC Facebook page. Please invite your ham friends! Make your own VOACAP predictions! Jari OH6BG have refurbished his site and it’s easier than ever to make predictions. Give it a try! The rules for SAC has been updated for 2018 and we have only made two minor changes in the rules this year. Use zero (000) as received serial number if you work and log a station that doesn’t send a serial number. Do not enter a “fake” number if you log a station that doesn’t send a serial number. QSO’s with zero in the received serial number field will not give QSO points nor multiplier points. QSO’s that we find with “fake” numbers will be lost, and may also lead to further penalties. We would also like to remind everyone of last years rule change regarding allowed frequencies. In 2017 a couple of participants missed the rule and lost all QSO’s that was made outside the allowed frequencies. SSB: 3600-3650, 3700-3800, 7060-7100, 7130-7200, 14125-14300, 21151-21450, 28320-29000 kHz. As always, read the rules before the contest! The changes in the rules are marked with red. We would like to inform about the current plaque status for SAC 2017. All the sponsored plaques should now have reached all happy winners, if not please tell us, support@sactest.net. The regular plaques are unfortunately delayed, and will be shipped later, hopefully within a couple of months. So please be patient. In the meantime, prepare for this years Polar Battle. The CW part takes place 15-16 September and the SSB is on 13-14 October. The SAC 2017 results are now final. 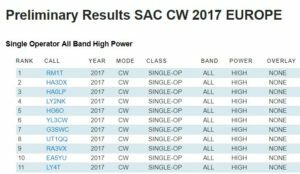 Single operator Assisted Low band High power – 9A9A (op. at 9A9A) NEW RECORD! Single operator Assisted All band QRP power – YD3VRY (op. at YD3VRY) NEW RECORD! SAC CW is over – Feed the Robot! As the CW part of the contest ended on Sunday evening the Robot received several hundred of contest logs. After less than 24 hours we have got 700+ submitted logs. Please don’t forget the new deadline: 5 days! The Robot will not accept any logs after 22 September 23.59 UTC. All logs are of interest, big or small, all will contribute to a better log checking. We are hoping to see lively bands with a minimum amount of aurora and polar flutter! Please take a look in the updated rules and choose a suitable entry category. Don’t forget to announce your own activity. Doing so will inspire others to join and make their own challenges. Those who have already signed up can be seen at Annouced operations CW and SSB. We have now implemented the IARU Region 1 band plan. OH6BG, Jari, is providing us with an excellent SAC propgation prediction service. Just select CW or SSB and put in your QTH-locator in order to get personal propagation charts for all SAC areas.